AP police constables recruitment syllabus 2018 PDF - AndhraEdUpdates | APPSC Notifications, CET exams, etc. APPSC, Job Notifications, CET Exams, etc. Andhra Pradesh police recruitment board SLPRB has recently announced recruitment notification for 2723 posts of several constables, warders, firemen, etc. 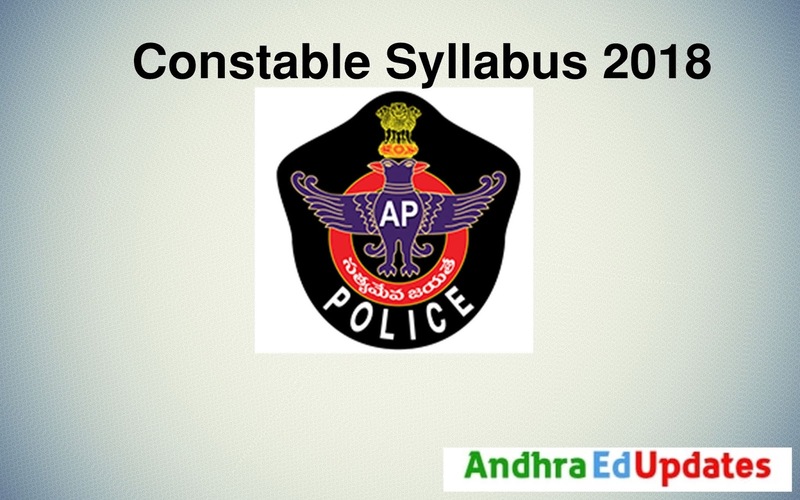 In detail, AP police constable syllabus is available here in this post. Aspirants can see entire information regarding AP police constable syllabus and exam pattern for 2018 recruitment. For best results and good marks, aspirants are advised to go through the syllabus completely at least once. All the updates regarding syllabus from Andhra Pradesh State Level Police Recruitment Board and study plans, admit card dates, etc. will be available here. Latest SLPRB constable syllabus 2018 attached here in this post. Check the complete details of subject wise constable exam pattern and syllabus. Furthermore, follow the notification at slprb.ap.gov.in and refer the constable syllabus 2018 for effective results. AP police constable test pattern 2018 is provided here. The constable paper pattern can give an idea about the weightage of topics, marks for each topic, and exam structure. www.slprb.ap.gov.in Exam pattern gives aspirants the idea about the type of questions that will be asked from the AP police constable syllabus 2018 to crack the preliminary written test. AP police Constable 2018 exam is an objective type of text. There will be 200 questions. The exam will be conducted for 200 marks. A maximum of 3 Hours will be allocated for the students. Basics from the subjects will be asked in this section. You can read Telugu Akademi textbooks of 6th to 10th class or NCERT books available online for free. Aspirants who are preparing for the AP constable 2018 exam go through the syllabus and start with easy topics first and then move to other topics. Start now even if you haven't seen the syllabus yet. Download the syllabus or write down somewhere so that you have a copy of the syllabus. Go through the previous year question papers to get an idea about the pattern of exam and how many marks are being allocated to each topic. Keep looking at official website www.slprb.ap.gov.in for any new updates or changes in the syllabus or exam dates.